Children's dance classes and ballet lessons, serving Illinois communities including Frankfort, Mokena, New Lenox, Manhattan, Homer Glen, Tinley Park, Orland Park, Palos Heights, Lockport, South Chicago, Worth, Crestwood, Chicago Ridge, Evergreen Park, Chicago Ridge, Mount Greenwood, and Valparaiso and Northwest Indiana. New to dance? Want to take your dancing to the next level? Want your kids to burn off some energy in a constructive environment? Ballet 5:8 School of the Arts’ is the place for you: There’s something for everyone! Children's Dance Division classes give boys and girls ages two and older a constructive space for learning through movement. 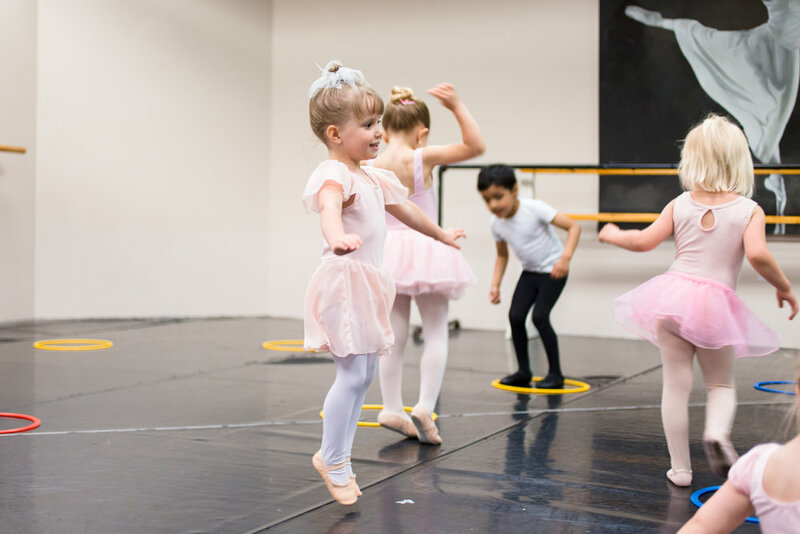 In a range of age-appropriate classes including ballet, tap and hip hop, young dancers learn important skills like rhythm, coordination, musicality, spatial concepts, and dance class etiquette. Positive role modeling from instructors and a nurturing environment made possible by our faith combine to allow young dancers to thrive! Whether children attend classes for a year or many, the physical and emotional benefits of dance education can last for a lifetime. Small class sizes that allow instructors to maintain an orderly classroom and give each student ample individual attention. Experienced, qualified instructors who enjoy working with students of all ages. Consistent, constructive class content based on age-appropriate curriculum. Modest attire and instruction using appropriate, edifying movements. High-value for your tuition dollars: 18 full weeks of instruction each semester, no “fluff” off weeks. A positive, nurturing environment based in the overarching joy that comes from our basis in faith (Romans 5:8) - learn more. New students are always welcome to attend their first class free with no registration obligation. Call the office to set up your appointment anytime. All of our instructors are highly trained and qualified in teaching. Many of the school's instructors are also professional dancers with the Ballet 5:8 Company, bringing a wealth of experience to their classes. Student instructors are required to progress through our teacher-training program with a minimum of one year of successful assistant teaching prior to instructing their own classes. Ballet 5:8 School of the Arts performances challenge students to use what they've been learning as a way to share joy and meaningful stories with audiences in a way that looks "out instead of in." Dancers studying ballet can perform in our two full-length ballet productions - Beyond the Nutcracker in December, and a rotating story ballet each spring - as part of the Children’s Cast. Our Winter & Spring Showcases highlight the accomplishments of dancers in classes like jazz, modern, praise dance and more. These fun-filled primary classes teach boys and girls foundational dance concepts through purposeful games and activities. Classes facilitate the development of skills like rhythm, coordination, musicality, spatial concepts, dance class etiquette and more in a positive environment. Start here for beginning and intermediate training in ballet! Classical ballet is a highly athletic art form that consists of a codified set of positions, movements and coordinations. When mastered, these enable ballet dancers to move with agility, control, speed, lightness, and grace. Ballet is one of the most difficult dance disciplines to master, but it also one of the most versatile. Ballet training can serve as a springboard for the continued pursuit of ballet or many other styles of dance. 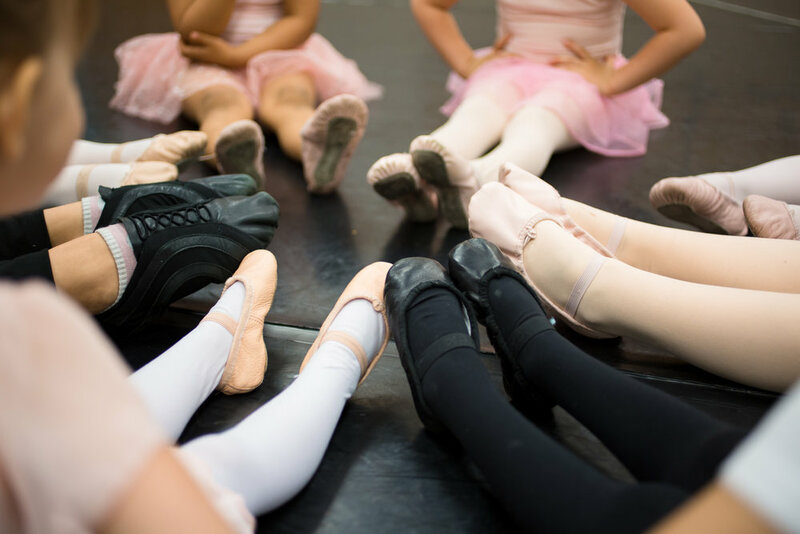 Beginning around age seven, students are physically and developmentally ready to begin learning classical ballet. Our Levels 1A and higher use Ballet 5:8's Vaganova-style classical ballet syllabus, which teaches crucial foundational building blocks in a specific progression based on time-tested ballet teaching techniques, the latest research in early childhood education, and attention to the physical safety of the growing bodies. Students who successfully graduate from Ballet 2B can receive placement in our Pre-Professional Program for intermediate/advanced level training. Boys Dance is a fun, high-energy, all-boys class that is great for boys just starting out in dance. This experience can be used as a springboard for future training in dance, or to gain additional strength and flexibility for sports like football and basketball. Praise Dance class is designed with Christian contemporary music and movement fundamentals, used to inspire you to use your dancing to lead others in praise! Praise Dance incorporates elements from many different dance styles and combines them with en emphasis on expression and artistry. No prior experience in dance is needed. Tap is an exciting style of dance where you create different rhythms and sounds using the metal on the toe and heel of your shoe. The combination of striking, brushing, hitting, stomping, and stepping with the metal creates the technical movements and rhythms of tap. In tap dancing, the sounds created by the shoes are just as important as the movements of the dancers. AcroDance is the art of dance and the athleticism of gymnastics put into one exciting class! In AcroDance, you'll begin to learn flips, inversions and acrobatics along with ballet-inspired dance curriculum. If you enjoy ballet and gymnastics, you are sure to enjoy this upbeat and challenging dance discipline! The rhythm and energy of jazz, contemporary and hip hop dance are contagious! When you hear an upbeat song, are you inspired to do a little dance right on the spot? These classes could be the perfect fit for you. There are many different forms of jazz and contemporary dance around us - think about “So You Think You Can Dance” and “Dancing with the Stars." Hip Hop is another popular form of dance today, a style developed over time through the influences of popular music and social economics. Hip hop dance is often used as an expression of emotions and individualism through both free dancing and choreography. At Ballet 5:8, we typically explore these dance styles using the music of Christian contemporary artists, creating upbeat, edifying movement. Irish Dancing is a traditional dance form that originated in Ireland throughout the 18th and 19th centuries. The most well-known form of Irish dance, Irish step dance, became widely popular thanks to dance shows such as "Riverdance." Irish step dance is performed to traditional Irish music and is commonly characterized by a rigid upper body and intricate footwork. Some common types of Irish dance include the jig and reel. Irish is a very fun, high-energy dance form! The best time to register is at the beginning of a semester! New students who apply after primary registration closes are accepted as space permits. Registration can be completed in person or online here. Families with multiple children enrolled get 15% off tuition for the second and subsequent students. Boys receive 50% off tuition. Tuition is discounted for individual students who enroll in multiple classes: 15% for two classes, 25% for three classes, or 40% for four or more. Ballet 5:8 is a 501(c)3 nonprofit community organization, and we are proud to work to keep our tuition rates as low as possible. Each division has its own handbook, including dress code information: view/download.